Rock Turbot or Northern Wolffish is an ugly bugger but its cheap and tastes fantastic. As you’d expect by its name it has a very similar texture to Turbot but at a fraction of the price. This Thai recipe takes minutes to prepare and the broth will work just as well with prawns or chicken. Place all the curry paste ingredients in a blender and blitz for a minute or until the mixture is completely smooth. Take 2 pieces of grease proof paper and cut them so they are just a little larger than the size of the fish. Season both sides of the fish with a little salt then place on the paper. Turn on your frying pan to a medium heat and add a splash of oil. When the pan has come to temperature carefully place the paper and the fish in to the pan. Watch the fish as it cooks and you’ll notice it beginning to turn white up the sides. Once the fish has changed colour 3/4 of the way up turn over then place a knob of butter in the pan and baste for a final minute. Once the top is nice and golden take the fish out and leave to rest for a minute. 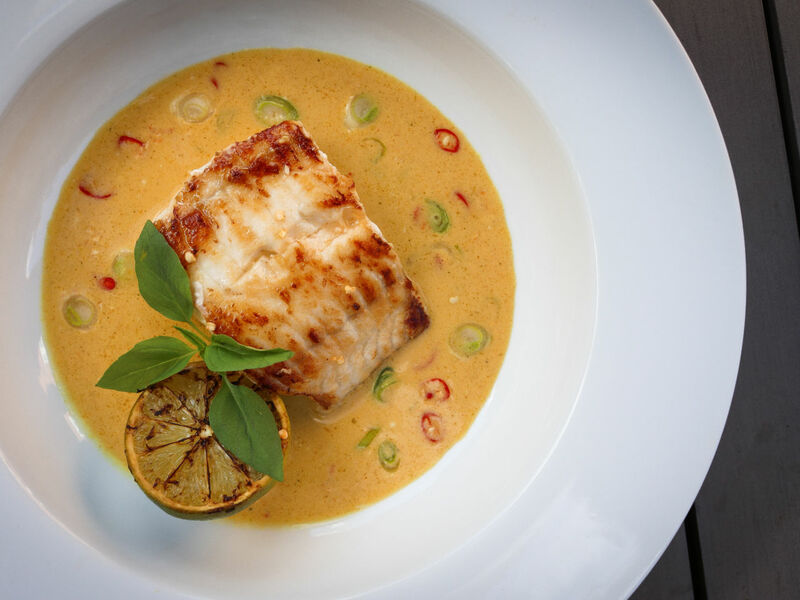 As your fish is cooking place the paste mix in a pan and gently cook off the rawness for a couple of minutes then add your coconut milk and stir well. Allow the sauce to simmer for about another 3 minutes. Slice your lime in half and in a hot pan place cut side down for 1 minute so the flesh gets a nice char on it. Time to serve. Pour your sauce in the bottom of the bowl then place the fish on top then add your lime.